The 1760s was the decade of literary forgeries. 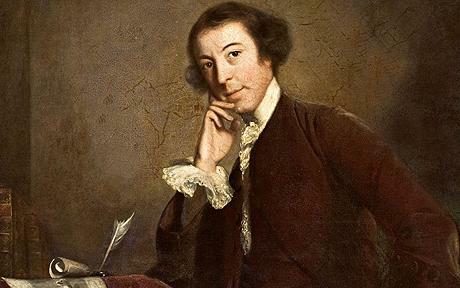 One of the most famous forgeries which that decade produced, Horace Walpole’s 1764 book The Castle of Otranto, was responsible for founding the Gothic novel genre. Walpole, who was the son of the first de facto Prime Minister of Britain, Robert Walpole, claimed the story was a genuine medieval manuscript which had recently been discovered and translated. The literary world flocked to buy this exciting new book. A year later, when the book was reprinted, Walpole added a preface in which he came clean and admitted that he’d made the whole thing up. In doing so, he founded not only a new literary genre but also one of the most perennial features of the Gothic story, the so-called ‘found’ manuscript. Many of the features of Gothic which endure today, such as the subterranean secret, the gloomy castle, and the mysterious ghostly sightings, were all used in Walpole’s novel. Without Walpole, it is doubtful whether there could have been any Edgar Allan Poe, Mary Shelley’s Frankenstein, Dracula, or even Stephen King. This one novel (which in many ways makes for a dull, laboured read) founded not only a genre but a whole style of writing. Walpole was also a prolific inventor of new words, and is credited by the Oxford English Dictionary with introducing over 200 words into the English language, among them beefy, malaria, nuance, sombre, and souvenir. But another lasting linguistic legacy was being the origin of the word ‘serendipity’, meaning the ‘faculty of making happy and unexpected discoveries by accident’. He coined the word in a letter of 1754, when recounting the ‘silly fairy tale’ (‘fairy tale’ is another term he is credited with inventing) of ‘The Three Princes of Serendip’ (Serendip being a former name for Sri Lanka). The tale is one of the earliest detective stories in existence: it recounts how three princes track down a missing camel largely through luck and good fortune, rather than any forensic skill. ‘Serendipity’ has been called one of the most difficult words to translate. Walpole’s influence on the Gothic revival extended beyond literature. His London house, Strawberry Hill, was a vast villa that approached the scale and appearance of a castle. Walpole’s house became so celebrated that it gave its name not only to an area of London (near Twickenham and lying in the London borough of Richmond) but also to a style of architecture known as Strawberry Hill Gothic. Pingback: 10 Words Derived from Books | Books Now! A really interesting post as I am writing a gothic novel Cheers! plagorism or copyright infringement? My site has a lot of unique content I’ve either authored myself or outsourced but it looks like a lot of it is popping it up all over the web without my agreement. Do you know any methods to help reduce content from being ripped off? I’d truly appreciate it. My blog has a lot of exclusive content I’ve either authored myself or outsourced but it looks like a lot of it is popping it up all over the internet without my permission. Do you know any methods to help prevent content from being ripped off? I’d really appreciate it. Reblogged this on CEOnlineWriting Blog.